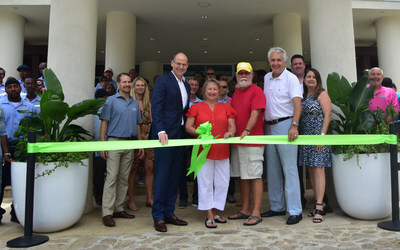 CLUB WYNDHAM owners Renee and Bill Binkley (center, in red) cut the ribbon to officially reopen the Margaritaville Vacation Club resort in St. Thomas with Wyndham Destinations President and CEO Michael D. Brown (left) and Margaritaville President of Development Jim Wiseman (right). Through its Wyndham Vacation Clubs business, Wyndham Destinations markets and sells vacation ownership interests and provides consumer financing to nearly 900,000 owners at an unmatched portfolio of brands including: CLUB WYNDHAM®, WorldMark® by Wyndham, CLUB WYNDHAM®ASIA, WorldMark South Pacific Club by Wyndham, Shell Vacations Club, Margaritaville Vacation Club® by Wyndham and WYNDHAM CLUB BRASILSM. Wyndham Destinations (NYSE: WYND) believes in putting the world on vacation. Our global presence in 110 countries at more than 220 vacation ownership resorts and 4,300+ affiliated exchange properties distinguishes Wyndham Destinations as the world’s largest vacation ownership and exchange company, with North America’s largest professionally managed rental business. Each year our team of 25,000 associates delivers great vacations to millions of families as they make memories of a lifetime. Learn more at wyndhamdestinations.com. Our world is your destination.